He sits on the low cabinet in our living room but my partner says we might find him in another place the following morning as he’s sure he’ll come to life at night! Creepy! He involved a lot of counting, so not one to do when holding a conversation. The stripes and the bobbles helped find my place each time I picked him back up. Filling the toes with tiny amounts of stuffing was very fiddly and I wasn’t expecting to have to sew the feet together but it didn’t take too long. He is rather larger than i was expecting but I love him just the same. He’s great, I like his bobbly back and feet. Thank you. I enjoyed doing him. He’s lovely – great colours. It’s not something I would normally do but thought him unusual. He’s unusual but adorable, I love all the different stripes and bobbles. Thank you for popping with your comment. Always appreciated. He is amazing! 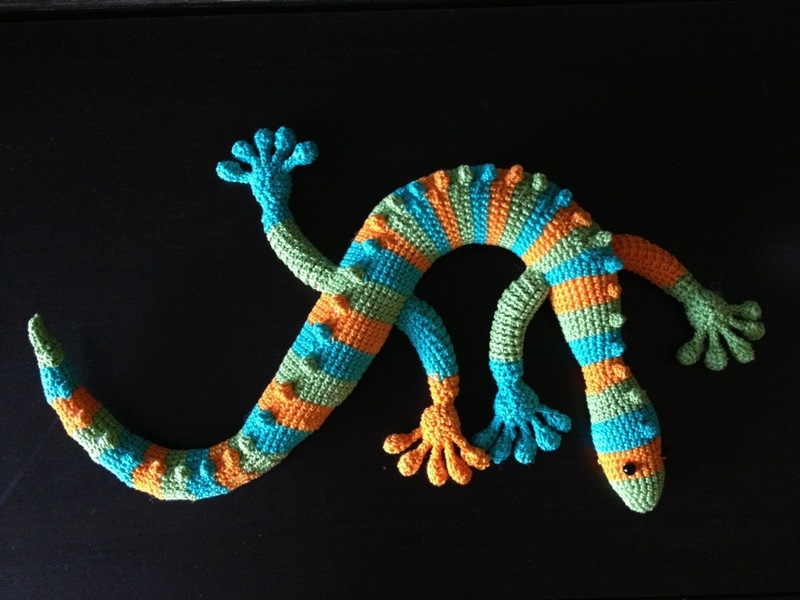 I’ve never seen anything like this made from crochet. It must have taken you ages! No, not really, just 4 good evenings. Thanks for stopping by. Thank you! And thank you for popping by. I love him too, his colours are fab, he really does look like he could come to life when you are not looking. He’s a bit creepy. I think it’s the eyes! 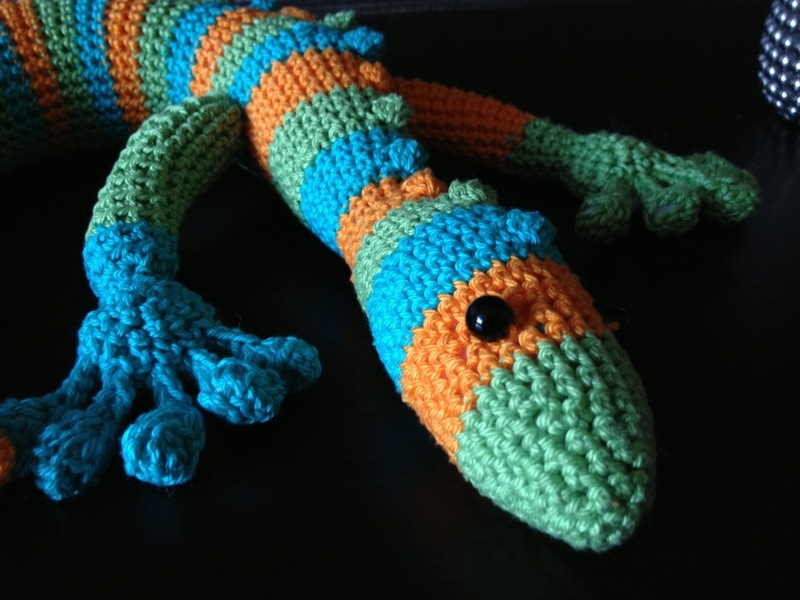 what a fantastic crochet make! lovely animal and the colours are gorgeous. 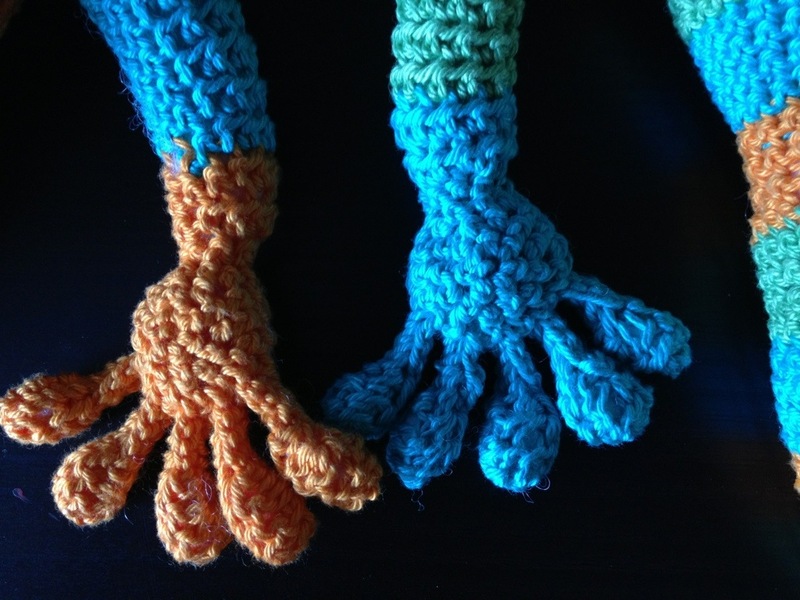 i admire your crochet skills, the gecko’s toes must have been very fiddly! 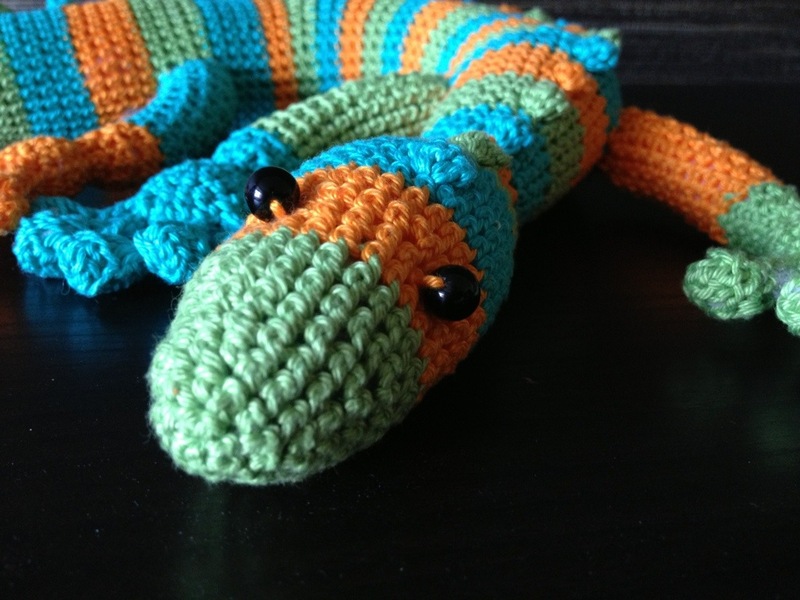 He was lovely to make, the pattern was very good. Oh my goodness! I though it was a real thing, when I saw the photo on Handmade Harbour link. There is so much detail – I really admire your patience. Thank you for stopping by. 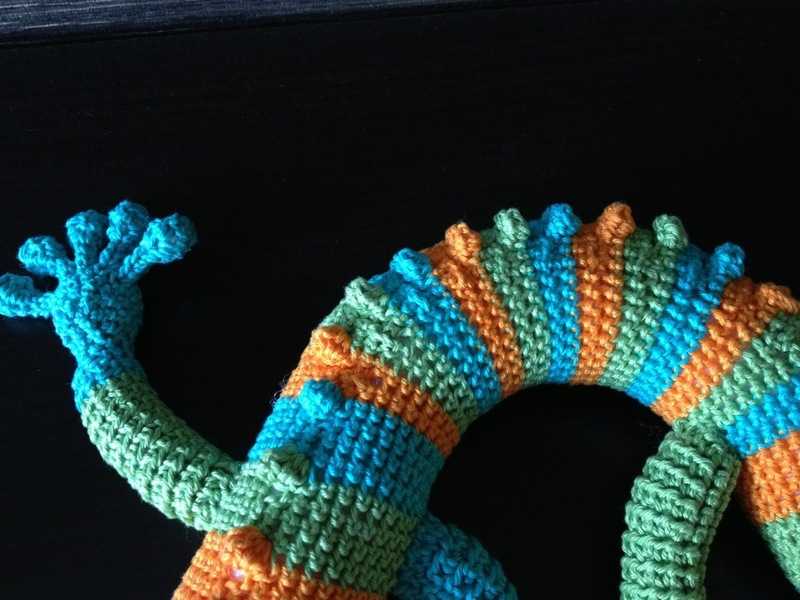 The pattern was really good but I did have to undo him in places a couple of times. Well worth it though. Thanks. He stands out well against my black cupboard. His feet were my least favourite part to make but the end result was good. Thank you. And thanks for popping by. Oh wow! That looks awesome. Thank you. I love him too! Thank you. I’m totally thrilled with this make. Thank you. Was a most enjoyable make. And pretty quick too. Thank you or popping by. I loved making it. Absolutely incredible! Your colors are fantastic! Thank you. He has been a very sucessful make and posting about him has brought me lots of new traffic. Thank you for popping by. I have to think what I can do next to match this one! 😉 He has pride of place in the living room. ¡ PRECIOSO ME ENCANTO,CUANTA CREATIVIDAD,FELICITACIONES ! Hi there I’m trying to make this little guy but my popcorn stiche’s don’t line up did yours? Perhaps a little advice is in order. Please help! Hello there! I found I had the same problem. I think you’ll be finding the popcorns tend to twist around? I placed my popcorns where I though best. Because of the increases and decreases they will never align perfectly so a stitch in front or a stitch behind the previous one. It was a long time ago since I made this chap so I can’t be entirely precise but I remember adjusting the popcorns a little.